Eagle, an otorhinolaryngologist, first described Eagle syndrome, also known as elongated styloid process, in 1937. 'Elongated styloid process' is a term used in reports concerning findings in both dentomaxillofacial and ear-nose-throat patients. Eagle syndrome is an uncommon but important cause of head and neck pain. The diagnosis is usually made by digital palpation of the styloids in the tonsillar fossa and can be confirmed by radiographs. The case reported here is unique in that the grossly elongated styloids projected in the oropharyngeal region like the tusks of an elephant. A 40-year-old female patient reported to the department of dentistry with the chief complaint of pain and foreign body sensation in the throat since 3-4 months. The pain was dull, pricking in nature, radiated to both the ears, and was aggravated by swallowing. She gave no history of trauma or tonsillectomy. On general physical examination, the patient was moderately built and nourished, with no obvious abnormalities. Intraoral examination revealed bony projections in the right and left tonsillar fossae [Figure 1], palpation of which elicited pain in the tonsillar region and base of the tongue. No other intraoral abnormality was detected. The patient was referred to the department of ear, nose, and throat (ENT) for further management. The ENT surgeon examined the oropharyngeal region and found two bony projections arising from the anteroinferior parts of each tonsillar fossa, piercing both sides of the tongue base. The bony projections were sharp and tender on palpation. Routine examination of the ear and nose was normal. Indirect laryngoscopy and blood and urine investigations were within normal limits. The patient was subjected to radiography, including reverse Towne view of the skull, which showed very long slender styloid processes on both sides [Figure 2]. A diagnosis of elongated styloids was thus made. 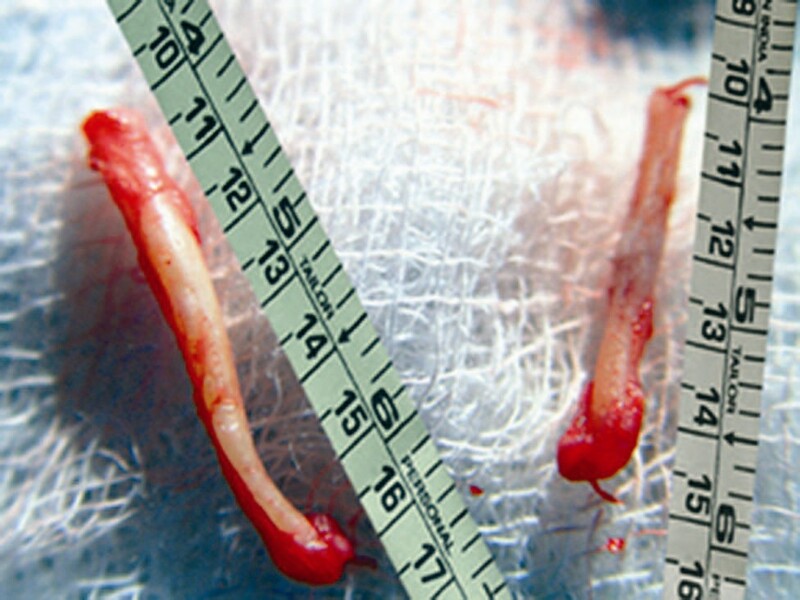 Under general anesthesia, after tonsillectomy, surgical removal of both styloids was done intraorally by subperiosteal dissection and excision with bone punches [Figure 3]. Muscles and ligaments attached to the styloid process were in continuity with the periosteum, and the attachments to the periosteum were restored. The excised styloids were about 6.0 and 4.5 cm in length [Figure 4] on the right and left sides, respectively, from their caudal end. The tonsillar bed was closed with sutures. The postoperative period was uneventful. The patient is asymptomatic 3 months after surgery. The styloid process, stylohyoid ligament, and the lesser cornu of the hyoid bone are derived from Reichert cartilage, which arises from the second branchial arch during embryogenesis. There can be several variations of the styloid chain, including variations in the length of the process, thickness of the segments, angle and direction of the deviation, and the degree of ossification. Ossification of stylohyoid ligament is said to be one of the causes of elongated styloid process. Stylalgia may be due to formation of a stiff bony clasp, which hampers the elastic movement of the stylohyoid ligament during contraction of the pharyngeal muscles, the pain being secondary to irritation of the sympathetic plexus around the carotid arteries or the sinus branch of the glossopharyngeal nerve. 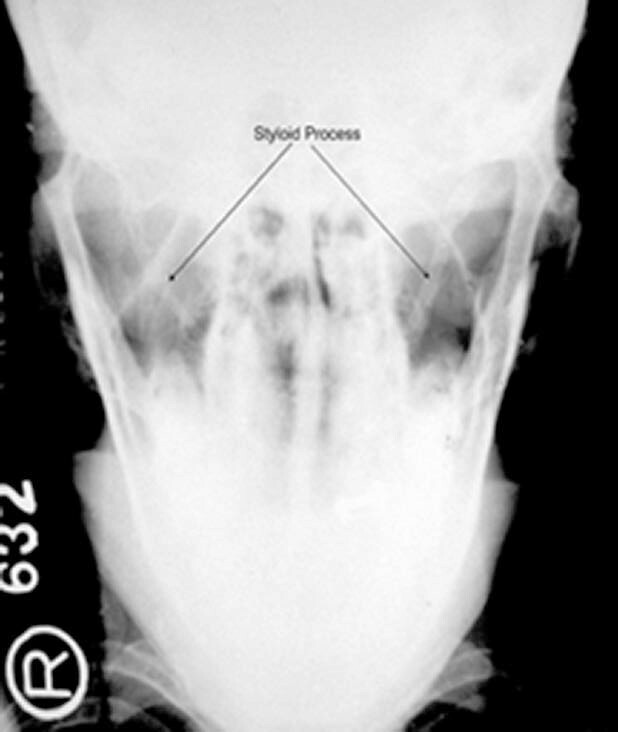 Elongated styloid process can cause dysphagia due to the formation of a pseudoarthrosis between the styloid process and the stylohyoid ligament, causing intermittent locking or fixation. The elongated styloid process in our patient was due to bony extension itself and no ossification of the stylohyoid ligament was present. The normal length of the styloid process varies greatly, although in the majority of patients it is 20-30 mm long. It is considered elongated when it is longer than 30 mm, and this occurs in around 4% of the general population. However, of these, only 4% present with symptoms that are attributable to the elongation. , An earlier study has reported that the average lengths of the left and right styloids were 1.52 cm and 1.59 cm, respectively, in Indian subjects. In the present case, the lengths of the right and left styloids were about 6.5 cm and 5.0 cm, respectively. Elongated styloid process is reported more frequently in women than in men. Symptomatic patients are usually over 40 years of age,  and this was true in the present case also. A wide variety of symptoms have been attributed to elongated styloid processes, including cervical pain, throat pain, earache, foreign body sensation in the throat, pain on changing head position, headache, pain in the cervicofacial region, pain on swallowing, shoulder pain, and sensation of a lump in the throat. The patient had throat pain, foreign body sensation, earache, and pain on swallowing. The diagnosis of elongated styloid process is based on the history and clinical examination, with aggravation of symptoms on palpation of the styloid process in the tonsillar fossa. The diagnosis is supported by the relief of symptoms following an injection of an anesthetic solution into the tonsillar fossa and is confirmed by radiography. , In this patient there was no history of trauma or tonsillectomy, and clinical examination of the oropharyngeal region revealed prominent bony projections in the tonsillar fossae, with tenderness on palpation; diagnosis was finally confirmed by a radiograph. Hence this is a case of styloid process carotid artery syndrome. This case is unique because there has been no report of oropharyngeal styloids in the literature to date. The elongated styloids can be treated surgically and non-surgically. A pharmacological approach, with transpharyngeal infiltration of steroids or anesthetic into the tonsillar fossa, can relieve symptoms, but styloidectomy is the treatment of choice. Partial styloidectomy was performed by the intraoral approach in the present case. Some authors have suggested that excision of the styloid process without disturbing the attachments of muscles and ligaments to the periosteum of the styloid process is an important factor in relieving postoperative pain and complications. We followed this approach in the present case. Variation is the law of nature. Every human is unique anatomically and even identical twins are not alike. It is important that clinicians, especially dentists and otolaryngologists, be aware of the anatomical variations of the styloid process. The presented case is unique in that the grossly elongated styloid processes projected into the oropharyngeal region like the tusks of an elephant. 1. Ilguy M, Ilguy D, Guler N, Bayirli G. Incidence of the type and calcification patterns in patients with elongated styloid process. J Int Med Res 2005;33:96-102. 2. Jung T, Tschernitschek H, Hippen H, Schneider B, Borchers L. Elongated styloid process: When is it really elongated? DentomaxillofacRadiol 2004;33:119-24. 3. Balbuena L Jr, Hayes D, Ramirez SG, Johnson R. Eagle's syndrome (elongated styloid process). Southern Med J 1997;90:331-4. 4. Leighton SE, Whittet HB, Golding S, Freeland AP. Styloid apparatus anamoly causing dysphagia. J LaryngolOtol 1991;105:964-5. 5. Prasad KC, Kamath MP, Reddy KJ, Raju K, Agarwal S. Elongated styloid process (Eagle'ssyndrome): A clinical study. J Oral MaxillofacSurg2002;60:171-6. 6. Thot B, Revel S, Mohandas R, Rao AV, Kumar A. Eagle's syndrome. Anatomy of the styloid process. Indian J Dent Res 2000;11:65-70. 7. Politi M, Toro C, Tenani G. A rare cause for cervical pain: Eagle's syndrome. Int J Dent 2009;1-3.2009:78297. 8. Yavuz H, Caylakli F, Erkan AN, Ozluoglu LN. Modified intraoral approach for removal of an elongated styloid process. 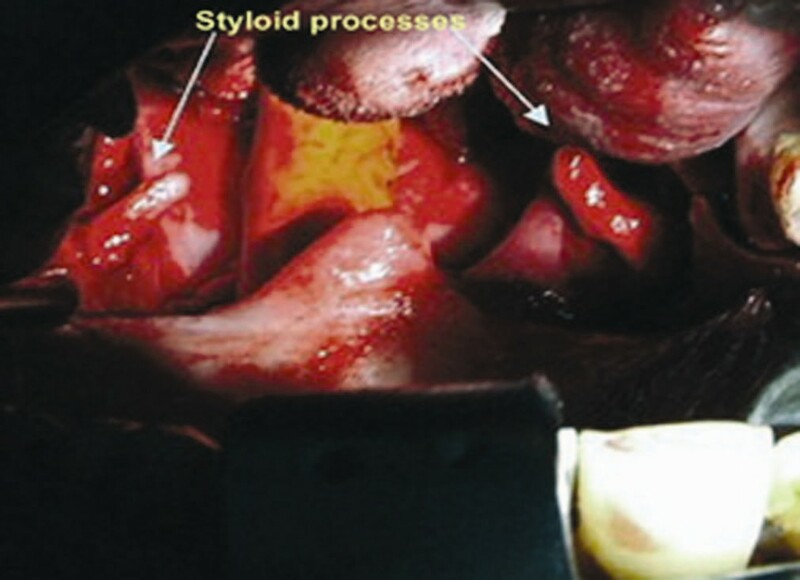 J Otolaryngol Head Neck Surg 2011;40:86-90.